The Accrington Food & Drink Festival 2017 – More than 14,000 people travelled into Accrington for the 20th annual Food & Drink Festival. It was a wonderful occasion with celebrity chef Richard Fox performing live cookery demonstrations, a live WW2 battle re-enactment to commemorate D-Day and an ‘Oops Upside Your Head’ world record attempt. All this along with over 70 stalls to enjoy, serving food, drink and much more. Thank you to everyone who attended and to our two main sponsors Duckworths Estate Agents and Accrington & Rossendale College. This entry was posted in Accrington, food festival, Uncategorized on June 20, 2017 by admin. THOUSANDS came out once more to enjoy the sights, sounds and the wonderful flavours of the Accrington Food & Drink Festival. 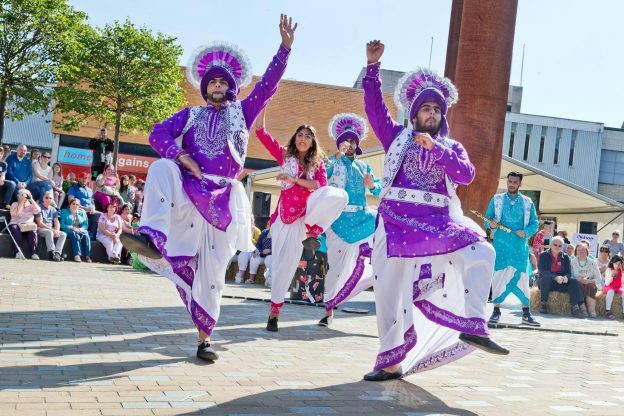 On Saturday, June 3, Accrington town centre was, once again, awash with foodies and revellers as they enjoyed what has come to be something of an institution in the town every year. 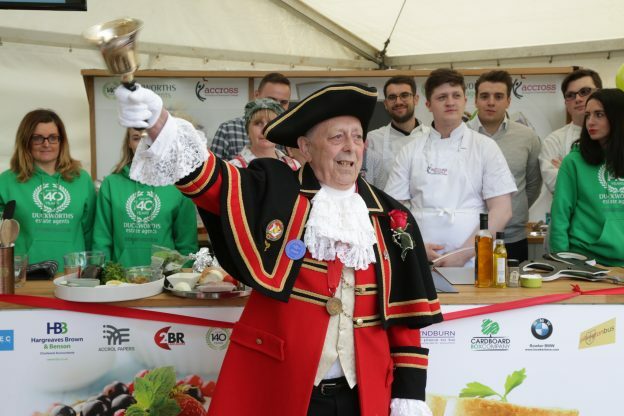 The 20th annual Accrington Food Festival, organised by Scott Dawson Advertising, built on the success of the previous two years, attracting numbers that even eclipsed the 14,000 of last year’s event. “We are always looking for fun new events and stalls to bring to the festival and this year we were really spoilt for choice. Richard Fox, in his third year at the festival, was fantastic as always, the WW2 re-enactment, the cooking demo from The Balti House, the Accrington Pals bus, the Oops Upside Your Head record attempt and many, many of the other attractions went down brilliantly. Live cookery demos in the theatre kitchen, hosted by celebrity chef Richard Fox, wowed the crowds. Over 70 food stalls lined the town centre streets offering everything from Catalonian meatballs and fresh, oven-baked pizza to chilli jam and prosecco cocktails. A dramatic World War 2 re-enactment, to commemorate D-Day, took place on the grounds of St James’ Church, complete with authentic weapons. The battle, which was between American and German troops, drew fantastic crowds as the sounds of the shots booming around the churchyard created a fantastic atmosphere. The live cookery demonstrations were also a big hit with Chef Fox cooking up North African Shakshuka, a dish consisting of poached eggs in a spicy tomato sauce. Another of the day’s highlights was the ‘Oops Upside Your Head’ unofficial record attempt which was carried out with great joy in the grounds of St James’ Church. There was also a poignant side to the record attempt as it was dedicated to the late Evonne Harwood – the ‘Wonder Woman of Warner St’ – who was instrumental in organising the record attempt and sadly passed away on April 22. The event was coordinated and the dancing choreographed by George De Rosa from Clubbercise Hyndburn. The event also raised money for East Lancs Hospice. Culinary students from one of the event’s main sponsors, Accrington and Rossendale College (AccRoss), managed to get a few mouths watering with their gin and tonic sorbet creation while the event’s other main sponsor, Duckworths Estate Agents, were running the hook-a-duck stall to raise money for cancer research. AccRoss students were also on hand in the market hall as they helped children write their names on sponge Accrington NORI bricks to build into a WW2 style Anderson shelter display. There was lots of attention for the static tank and the old Accrington Pals bus which was on display – as money was raised to return the old bus to its former glory. The support for the idea of restoring the last Accrington Corporation bus remaining in the colours of the East Lancashire Regiment was truly overwhelming. The proposal to make the restored bus available to local schools to transport children to local attractions was received with great enthusiasm. This entry was posted in Accrington, food festival on June 6, 2017 by admin.